Tonight (November 28), Malaysiakini will celebrate its 10th anniversary with a big bang. I am sure the dining will be fine and the entertainment amusing, but like my fellow columnist Dean Johns, I will not be able to attend. I too will celebrate the occasion in spirit. While we are still on this spirit of congratulatory joy, I would also like to pay tribute to the columnists who have travelled this long and sometimes arduous journey with co-founders Steven Gan and Premesh Chandran. I believe that we Malaysiakini columnists have also contributed in no small measure towards building the distinctive journalistic identity on this website. Of course, we all know that news is the hard currency of journalism while opinions are free. Every day for the past 10 years, dedicated reporters, journalists and news editors work tirelessly to bring the latest news to their readers, often hours before they appear elsewhere. I have seldom met them, having been to the Malaysiakini office in Bangsar Utama once or twice. They too have to overcome all kinds of problems, like getting to attend government functions and the press conferences called by government ministers. I do share a spirit of fraternity with them though, because we are working for the same goal – furthering the freedom of the press and promoting democracy in Malaysia. The columnists, on the other hand, play an equally important goal. While the news stories provide you with hard facts, the who, the what, the how, the where, the when, and the why of significant happenings, the columnists add flesh and bone to the hard cold facts, drawing out the nuances behind the events, extracting inferences and implications from mere happenings, and putting the latest development of any issue in a meaningful context. The columnists do this by contributing their specialised and general knowledge, their experience, and their native wisdom. They also learn from reading one another. I had been a columnist for the Chinese-language Sin Chew Daily and Nanyang Siang Pau since the mid-1980s. The editor would always tell me what subject area to avoid for the sake of their publishing and printing licences. Writing under self-censorship felt like castrating oneself spiritually. Those were unhappy years. You could imagine my joy of writing a column for Malaysiakini when I was left completely alone to write whatever I wanted to. It was like being liberated from a mental prison and breathing fresh air for the first time. It was a Malaysian writer’s dream come true. With freedom, comes heavy responsibility. I and other writers in Malaysiakini have to show the way on how critical, independent and fair commentary can be like in Malaysia. We can be politically engaged, and yet remain non-partisan. We must always be committed to telling the truth even if it is just our subjective truth. Our only agenda must be one dedicated to the betterment of our country and her people, and as far as possible, we ought to give a feeble voice to the dispossessed, the oppressed, and the marginalised. These are the noble values of the European Enlightenment, but while many of the Enlightenment values are less talk-about lately, their aspirations for universal values such as knowledge, justice, truth and emancipation ought to be emulated. For a role model, I looked to the late Hugo Young, the very distinguished columnist for UK’s Guardian. When he died on September 22, 2003, even the then British prime minister Tony Blair led a national accolade in praising the rich journalistic legacy he left behind. The accolades that poured forth during Young’s funeral services painted him as a journalist of the highest order, “A beacon of enlightenment in what can seem like a tarnished world”, “A lifelong defender of truth and decency”, and “He set the bar in quality, moral authority, and genuine influence.” He was indeed all that. Nowadays, I still read almost every column article by Paul Krugman and Maureen Dowd on New York Times online. Their kind of English is typically American, and takes some deciphering for us at times. But I admire their knowledge, their razor-sharp intellect, and the fearlessness in their pursuit of truth. Naturally, I hardly read columnists in the Malaysian mainstream media for I know first hand the kind of constraint under which they have to work. Perish the thought that they should one day invite people like me to write columns for them. First, we have to change the government, and then the Star and the New Straits Times will have to change ownership. So I have been proud of being a member of the Malaysiakini team. I always try my best to give my best to the readers. I seldom miss a deadline without good reasons. Professionalism does demand commitment. Above all, I always try to be original, because being boring is probably the worst sin for any columnist. I have been a columnist for Malaysiakini for the last six or seven years. I have received hundreds of emails from numerous readers. Most of them are polite and encouraging, though I still get the odd ones from readers who have problems reading my simple English. I try to reply to every reader who takes the trouble to write me. If there is anything I complain about the Malaysiakini readership from within Malaysia and abroad, it is this: they agree with me too much. No columnist can always be right, and sometimes, apart from factual mistakes, there must be flaws or incompleteness in argument. A vibrant public sphere will draw many readers into debate with their columnists, and with one another. Perhaps such a healthy public sphere has never existed in Malaysia until the opportunity arises when Malaysiakini and other Net news portals came along. We have never really begun to engage one another in a honest, critical but courteous debate on major issues of the day. In the comments posted by readers after all those Malaysiakini column articles and news items, readers are still prone to knee-jerk comments, lacking reasoned arguments and penetrating insights. In many cases, comments degenerate into name calling and ugly profanity. In a civilised society, we address our opinions to the ideas of others and not to their person. Just because we disagree with them does not make them bad people. Diversity of views is always good for the growth of a vibrant public platform for the different narratives to find their niche. In any case, we are a young democracy, and we have a lot to learn as a people. At least, we still have a free and fair forum like Malaysiakini to try out our craft, and to practise what we perceive to be authentic, transparent and progressive journalism. Posted in civil society issues, Media. Opposition Leader Anwar Ibrahim today urged UMNO leaders not to hide behind Biro Tata Negara’s (BTN) courses to talk about “the insecurities of the Malays”. At a press conference in Parliament today, the PKR de facto leader claimed that the programme has promoted a racist approach. “I totally disagree with the racist approach. UMNO leaders (use) the closed-door sessions to talk about the insecurities of Malays – that they have been marginalised – and suggesting that this has been done by the Chinese and the Indians. He said the opposition has always been the target and accused of ‘splitting the Malays and (causing) disunity”. “If that’s how they view it, then let’s debate it. Why hide? Now you see in the whole polemics that they are blaming the Chinese and Indians, particularly the DAP, for suggesting that the BTN should be reviewed and revamped,” said Anwar. BTN, an agency under the Prime Minister’s Department, aims to nurture the spirit of patriotism and a commitment to excellence among Malaysians. For decades, it has conducted courses for students, young leaders and civil servants. The controversy was triggered when Selangor government imposed a ban on attendance at BTN, claiming that it promotes “racial politics and BN/UMNO ideaology”. In a related development, DAP veteran leader Lim Kit Siang today said the revamp of the BTN curriculum cannot take place if federal ministers keep defending the “racist and destructive” programme. While he welcomed the announcement on the revamp, Lim said many top UMNO ministers “seem to be unaware of this cabinet decision”. They include Deputy Prime Minister Muhyiddin Yassin, Home Minister Hishammuddin Hussein, and Women, Family and Community Development Minister Shahrizat Abdul Jalil, Agro-based Industry Minister Noh Omar and Deputy Minister in the Prime Minister’s Department Ahmad Maslan. “Last Thursday, Muhyiddin defended the BTN (but) Hishammuddin, Noh Omar, Shahrizat and Ahmad defended the divisive, racist and seditious BTN course only over the weekend…. (they also) condemned critical voices including my call for the closure of the racist and seditious BTN courses as these make a total mockery of Prime Minister Najib Abdul Razak’s 1Malaysia slogan and concept. Negri Sembilan Politics: Making Way for Isa Samad? 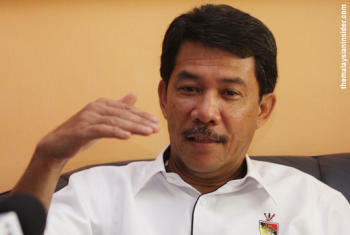 Negri Sembilan UMNO warlords are using allegations of an illegal money transfer to unseat the unpopular Datuk Seri Mohamad Hasan, whose aides denied the mentri besar is under central bank probe. “We believe that there is no point letting the issue being exploited by the opposition, the leadership must take action, now we are just waiting for the president’s return,” a Negri Sembilan division chief told The Malaysian Insider. UMNO president Datuk Seri Najib Razak is now attending the Commonwealth Heads of Government Meeting (CHOGM) 2009 in Port of Spain, Trinidad and Tobago. Mohamad, who became mentri besar in 2004, is currently under Bank Negara Malaysia (BNM) probe for allegedly transferring funds amounting to RM10 million to London through a money changer, Salamath Ali. An aide to Mohamad said the BNM probe has nothing to do with his employer. “The investigation is against the money changer and not against Datuk,” the aide told The Malaysian Insider. The Malaysian Insider understands that Mohamad has privately blamed his staff for making him use the services of the money changer. Pakatan Rakyat’s Batu MP Chua Tian Chang revealed the matter after the central bank said Salamath Ali Money Changer had contravened Section 30 of the Money Changing Act 1998 and its licence had been revoked on October 26. State UMNO warlords are making their moves now to prevent the issue from being further exploited by the opposition. “He is already not liked by 80 per cent of the UMNO members here, so this case will not be ignored,” said the division chief. The state Umno warlord pointed out that despite the blackout by the English and Bahasa Malaysia mainstream press, the issue has found its way to the party grassroots via text messages. “UMNO members in Jempol, Kuala Pilah, Rembau they don’t access the Internet, so initially only civil servants talked about it, later people started sending SMS on ‘kes duit haram MB’,” he said. Mohamad came under fire from Negri Sembilan opposition leader Loke Siew Fook during the state assembly sitting over the issue but the Rantau assemblyman kept mum and refused to give an explanation. Opposition lawmakers have also called on the Malaysian Anti-Corruption Commission (MACC) to conduct a probe into the scandal. Mohamad had also refused to talk about the matter openly at a press conference early this month. Malaysia’s massive port scandal, which has received enormous publicity, implicating a wide swath of past and present officials at the very top of the national coalition government, is confronting Najib Tun Razak, the prime minister, with an unappetizing list of choices given his public rhetoric about cleaning out corruption in his party and government. The cost overruns in the disastrous attempt to turn the Port Klang seaport into a national multimodal transshipment involve top figures in the Malaysian Chinese Association, the second component of the ruling national coalition, as well as influential members of Najib’s own party. As with a staggering number of industrialization projects dreamed up by former Prime Minister Mahathir Mohamad, the Port Klang free zone appears to have served as a kind of gigantic smorgasbord from which officials picked out whatever they wanted to enrich themselves. In September, police froze the bank accounts of Kuala Dimensi Sdn Bhd, the corporate entity with the contract to build the port, while they attempt to sort out what happened. There is also the question of the involvement of the cabinet itself. According to June 22, 2007 documents classified under the country’s Official Secrets Act as secret (Rahsia), which were obtained and translated by Asia Sentinel, and other documents, it appears that the government, through the reigns of Prime Ministers Mahathir Mohamad, Abdullah Ahmad Badawi and the current prime minister, Najib Razak, retroactively and illegally authorized payments and bonds that have driven the cost of the project from an original RM1.96 billion (US$577 million) in 1999 to a potential RM12.45 billion if the port defaults and is forced to pay interest on its debt, according to a report by PriceWaterhouseCoopers Advisory Services. Two transport ministers who previously headed the Malaysian Chinese Association, and three of the four Port Klang Authority chairmen went along with the cost overruns, much of which appear to have stemmed from out and out corruption. The current chairman Lee Hwa Beng, is an accountant and has supported attempts to bring the scandal into the open. The port’s directors say it is now likely to default on billions of ringgit in loans, with the possibility, according to the PriceWaterhouseCoopers report, that accumulated interest could drive the cost up by more than a factor of six. The scandal has caused havoc inside the MCA, with the current transport minister, Ong Tee Keat insisting that all the reports related to the affair be released to the public. Those efforts caused his enemies to overthrow him as MCA president. The party is now considering intra-party elections to install another leader. Others named in the PWC report included UMNO officials Abdul Rahman Palil, Abdul Rashad Asari, Omar Latip and Idris Mat Jani, who served in various capacities either with the development cooperative, the supposedly independent surveyor, the law firm advising Kuala Dimensi or as shareholders in allied companies. 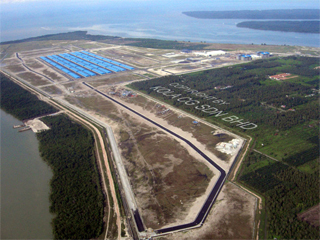 Kuala Dimensi, having acquired the land for the free trade zone, was appointed to develop it. That resulted in cost overruns mounting to the hundreds of millions of ringgit. According to The Sun, a Kuala Lumpur newspaper, the Dubai-based Jebel Ali Free Zone, originally appointed to manage the port, gave up and pulled out in 2007, allegedly because of interference from politicians and figures with vested interests, deliberate falsification of minutes, attempts at tax evasion by Malaysian negotiators and other issues. It appears that management was so substandard, according to a report by yet another committee, that the port didn’t even have revenue or cost projections. If the government’s past track record of investigation is any harbinger, it is questionable what will be done. In 2007, the Malaysia Anti-Corruption Commission was asked to investigate the plethora of illicit payments and kiting of land prices. The MACC declined to do so in 2007 according to Mohd Sidek Hassan, the chief secretary to the government. Under pressure from the magnitude of the controversy, the MACC is now investigating how the price of land for the acquisition of the project ballooned out of control and will probe financial records pertaining to payment claims and other issues such as conflicts of interest. It is a safe bet that none of those issues will involve how the Malaysian cabinet agreed to ratify the letters of guarantee issued by the Transport ministry despite the fact that only the Treasury Ministry can legally issue such letters, and how it authorized the backdating of billions of ringgit in bonds and other costs over the past several years. Some of the actions would appear almost laughable, if the cost weren’t roughly RM500 for every one of Malaysia’s 25.7 million people according to one report. On Nov. 4, according to local media, a Corporate Governance Ad Hoc Committee on the free zone project recommended the creation of an Ethics and Integrity Monitoring Committee and the appointment of independent non-executive members who would constitute one-third of the port’s board of directors. A seminar on corporate governance and transparency will be scheduled. 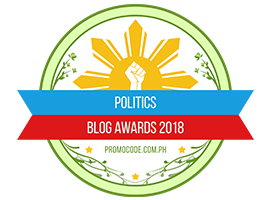 But this time, judging from the numbers of bloggers and independent commissions – and the phenomenal size of the scandal – something might actually be done, and somebody might go to jail. DAP has urged the Federal Government to reconsider the proposed 4 per cent Goods and Services Tax (GST), claiming it would do nothing to narrow the nation’s current deficit budget and would only further burden the poor and the middle class. 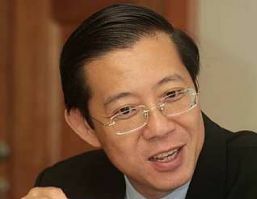 Party secretary-general Lim Guan Eng said that the Government should, instead, concentrate on fighting corruption and realising savings of at least RM28bil annually instead of a mere RM1bil in additional revenue from GST. “This RM28billion was admitted by Second Finance Minister Datuk Seri Ahmad Husni Hanadzlah as the cost of leakages from having closed tenders in government procurement or just failing to have open tenders for government contracts in an open manner. “If the government focuses on changing this, there is no need to impose GST on the people to raise funds. But unfortunately, the Barisan Nasional is not brave enough to truly fight corruption,” he said in his opening address at the Perak DAP’sn 15th annual convention here today. In fact, Lim pointed out the supposed RM28bil in losses to corruption annually may even be an under-reported figure. “As Time Magazine had quoted Daniel Lian, a Southeast Asia economist at Morgan Stanley in Singapore, saying that Malaysia might have lost as much as US$100billion since the early 1980s to corruption,” he said. Lim said that the proposed 4 per cent GST, which is set to be tabled in Parliament early next year, would not widen the tax base much, seeing as the present budget deficit was over RM50billion. “So what is an additional income of RM1billion annually? In fact, this GST would only serve to affect 85 per cent of the working population who currently do not pay taxes because their incomes are below taxable levels. “The impact would be most severely felt on the 38 per cent of the 5.6 million households with income levels of less than RM2,000 monthly or 2.12 million households,” he said. Lim also voiced disappointment over the “unconditional support” for “UMNO’s GST” by MCA Gerakan, SUPP and MIC. “No MCA minister has defended public interest but has continued to perpetuate this national economic divide by burdening the poor and the middle-class instead of fighting corruption to get more money. Why fear fighting corruption so much?” he said. Lim also called for the withdrawal of the 15 per cent preferential income tax rates given to professionals in selected areas on the Iskandar Development Region, saying that the benefit should be offered to all professionals in Malaysia. “Why is it that professionals in other states have to pay 26 per cent? How can there be 1 Malaysia when we have one country and two systems with double standards and discrimination in tax treatment?” he questioned. Co-founders Steven Gan and Premesh Chandran tonight thanked thousands of Malaysiakini subscribers for their support in keeping the 10-year-old news portal “financially independent”. At the Malaysiakini 10th Anniversary Dinner at the Sime Darby Convention Centre in Bukit Kiara, Gan told the 1,000-strong crowd that the founders’ unwritten motto has been “independent media needs independent financing”. “Malaysiakini today is one of the two news websites in the world – the other being Wall Street Journal – which have made the subscription model a success. It’s a feat which has gone relatively unnoticed,” said Gan, who is Malaysiakini’s editor-in-chief. According to chief executive officer Chandran, Malaysiakini subscribers have “voted with their wallets against the tide of free content”. “Over 117,000 stories and 2,000 videos in four languages, published to an audience of two million unique readers – when we launched Malaysiakini, we never believed we would get this far,” said Chandran. Chandran noted that the 10th anniversary marked “the end of Chapter 1 of the Malaysiakini story”. “What used to be a dangerous ‘blue ocean’ waters has now become a ‘red ocean’ with new ‘independent’ news portals being launched regularly. “Whereas Chapter 1 was about building a ship in hostile waters, Chapter 2 seems to be about maneuvering the ship forward towards new unchartered territories, developing new competitive advantages and reaching out to new audiences,” he said. “Malaysiakini will be embarking on this journey with the same zeal as we did 10 years ago. We are preparing, looking forward to the mobile and the Internet TV space, as well as exploring social media. Among those who attended the anniversary dinner were Selangor Menteri Besar Khalid Ibrahim (PKR) and a number of his cabinet members, Information, Communications and Culture Deputy Minister Heng Seai Kie (MCA) and Shah Alam parliamentarian Khalid Samad (PAS). Gan, in his speech, referred to Chinese philosopher Lao Tzu in describing Malaysiakini’s mission. “Lao Tzu said: Go to the people. Live with them. Learn from them. Love them. Start with what they know. Build with what they have. But with the best leaders, when the work is done, the task accomplished, the people will say, ‘We have done this ourselves’. Posted in civil society issues, Democracy, Leadership, Media.